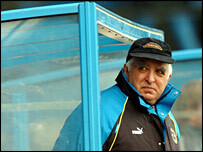 Cardiff’s ex-chairman Sam Hammam takes a wrong turn at metaphor junction. Mike Newell, a spokesman for chauvinists everywhere. Massimo Maccarone, a man after our own hearts. Ian Holloway takes a shine to Joey Barton’s arse. Maybe someone should have told Javier Mascherano a bit more about his new club. Palermo president Maurizio Zamparini, after the Fiorentina striker scored while one of Palermo’s players lay injured. Terry ‘Tel Boy’ Henry doesn’t want to be a Cockney. Dean Ashton. He likes biscuits. Ken Bates responds to Chelski’s accusations of racism against Leeds Utd. Sir Alex Ferguson remembers the scariest part of his 20 years in charge at Old Trafford. Oh my god, this are all hilarious! Ken Bates quoting Daley Thompson – that’s funny!